Latest GHS labelling supplied - see note below & image. 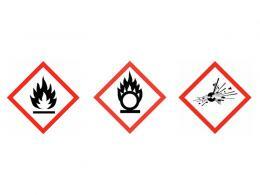 It is the responsibility of the user to ensure that the signage displayed on the COSHH cabinet is appropriate to the chemicals and products stored within. We will supply you with a primary label meaning 'flammable' and additional labelling including 'oxidising' and 'explosive' - see image. If you have special requirements such as a sloping top or stands with adjustable feet, please call our experienced sales team on 0800 0126777 (standard office hours). 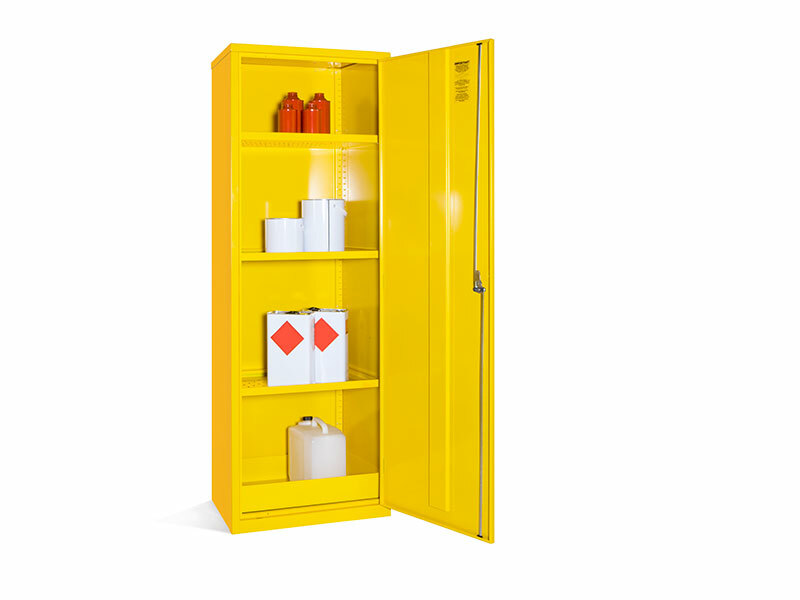 Designed specifically to comply with CHIP and CLP (classification, label, packaging) regulations regarding hazardous substances, this COSHH (Control of Substances Hazardous to Health) cabinet is ideal for storing all hazardous or potentially dangerous materials. 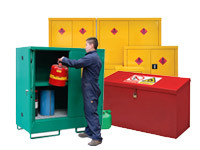 This safety cabinet is built to last, with steel door thickeners, a leak proof base, and 1.5mm thick doors and walls. With three shelves, this cabinet can hold materials of various sizes and weights, though very heavy materials should always be placed on the bottom of the cabinet for safety. Ideal for holding paints, chemicals, solvents, or other hazardous materials, this is the COSHH cabinet that all facilities using these substances need. In addition to being sturdy, this COSHH cupboard is also safe. It features a three point locking system and a master keyed lock that comes with two keys. What is the purpose of the Slim COSHH Cabinet? This chemical storage unit is designed to hold materials designated as hazardous to our health, as per CLP regulations. With reinforced doors, a three point locking system, leak proof floor, and 1.5mm thick sides, this cabinet can contain it all safely. Where can this Hazardous Cabinet be used? This chemical cabinet can, and should, be used in any environment that contains hazardous materials, as designated by CLP regulations. This might include, but is certainly not limited to: paint, solvents, chemicals, and cleaning items. Who might use this COSHH Cabinet? This COSHH cupboard might be used by mechanics, construction teams, laboratories, janitorial staff, painters, and shops that supply any of these professions. This cabinet is available is 1830H x 610W x 457D mm and has a 20 litre sump capacity. 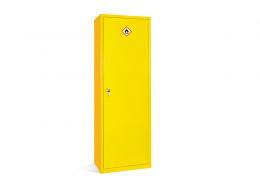 All COSHH Cabinets are powder-coated paint in bright yellow for visibility. This cabinet comes with a standard 1-year parts/labour warranty. **NOTE: The CHIP regulations were revoked on 1 June 2015, and have been completely replaced with the CLP regulations. Materials on the shelf prior to 1 June 2015 with correct labelling according to CHIP, it does not have to be recalled to comply with CLP regulations.